I would like to think I will always be a fair person, when your rival or enemy plays the game skilfully, the right thing to do is to show your admiration. It is with this ingrained sense of fairness that I say hats off to the Supreme Leader for managing to get over 70 percent of the Iranians to take part in his sham "elections". So after all that blatant vote rigging in 2009 and the heavy handed crackdown which led to so much suffering, how did they do it? No one knows the psychology of the Iranian people better than the ruling clerics and the elite. Their tactics to bring the masses to the ballot box was no different than the good cop/bad cop methods they use in breaking down prisoners in the Islamic Republic. For four years the people are deliberately humiliated, they are trodden on, none of their demands are met, they are counted as nothing and made to suffer. When the price of chicken goes through the roof as a result of mismanagement and hoarding, they are told "So what? you don't have to eat chicken, eat something else". Then only one week in a year, the same people who have suffered four years of constant humiliation are suddenly endeared and they suddenly matter, so long as they say the "right thing" and do the "right thing". The humiliated beaten soul, hungry for a small piece of affection and respect, will then find the moment so joyful and intoxicating that it will do anything for its tormentor. Iranian nationalism which is frowned upon as anti-Islamic is rejuvenated in the weeks before the elections. Iranian patriotic songs showing the glories of the pre-Islamic past and the country's mountain peaks and other natural land marks are constantly played on state TV. Stage managed interviews with passers by suggest that ALL Iranians will go and vote. Women without the state preferred cover, the chador, and even with make up and loose head scarfs are also interviewed, they too, all say they will vote. "Because it is my patriotic duty"
"Because I want to choose my own destiny"
"Because I have been given the right to vote and I should appreciate it"
"Because the martyrs would want me to vote"
No passer by is heard in the stage managed interviews saying but they have hand selected the candidates for us or that nothing ever changes by their votes. All good people will vote and its only the baddies and the enemies who will boycott. This time the Supreme Leader and the ruling elite made an even bigger effort to get the public to vote. 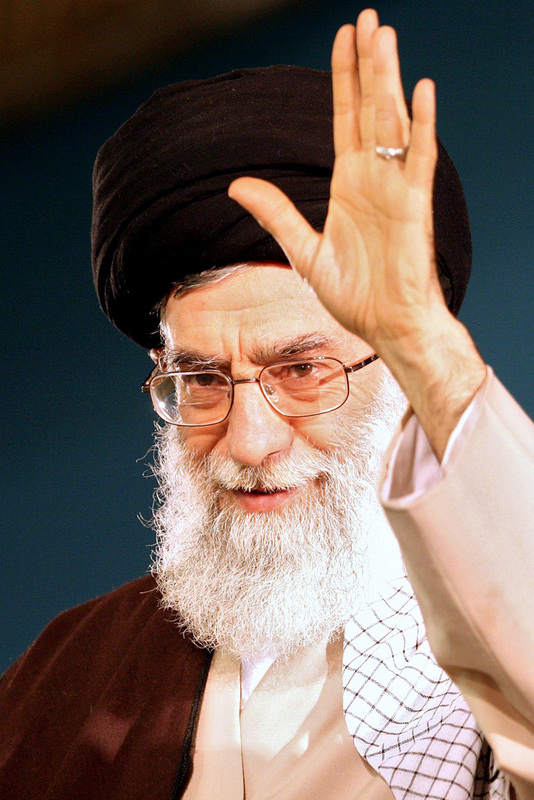 The Supreme Leader even appealed to those "who for whatever reason are against our Islamic system but love the country" to come and vote. His reasoning was that a large turnout will strengthen the regime in its negotiations with the West. Who the people voted for was irrelevant. Why should it matter which hand selected candidate they voted for? Ayatollah Makarem, even spelled it out explicitly "everyone should come and vote, even if they cast a blank vote" and Mashad Friday Prayer warned the faithful that "those who do not vote, for sure will go to hell"
The local council elections which was due to be held three years ago, had been postponed without a reason and instead held on the same day that the presidential elections was to be held. Many Iranians will vote in the local elections regardless of what they think of the regime and it made sense to bring them to vote too. What was important, was to show queues of people voting, not who they voted for or in which election they voted. On top of all this, the regime got the help of the BBC Persian and the reformists in Iran too. It is important to clarify what is meant by reformists here. Reformists in Iran should not be mistaken by what you may imagine as those who organise and mobilise non-violent civil disobedience movements. For some time now, Iranian reformists are merely those who try to please the establishment so that they may once again be included in the government administration. The reformists backed the participation in the elections without asking for any concessions and without demanding any pre-conditions and this was their best chance. Even the former spiritual leader of the US embassy hostage takers in the 80s, Ayatollah Moussavi-Khoeiniha, now a reformist questioned the merits of taking part in anything under any conditions and any price. The regime didn't want queues just inside Iran, they wanted pictures of queues outside Iran too. They held ballot boxes in their embassies and consulates and many Iranian expats who had taken part in the Green demonstrations outside Iran in 2009, also took part in the masquerade election. To me their treachery is unforgivable. Even if I can be persuaded somehow to understand the justifications for voting inside Iran, I will never accept that it was necessary for Iranian ex-pats to vote outside Iran. At least they could have gone and voted with T-shirts of Neda and other 2009 martyrs, or they could have been holding posters of Green Movement leaders and current political prisoners or chanted anti-establishment slogans while they were queuing in the street, but they went in like sheep being directed to their pens. They showed no protest or discontent. When I asked one of them why they didn't do so, the reply was "Moussavi and Karroubi's pictures were in our hearts!". Unfortunately cameras can not take such pictures yet! The expat voters could not even demand from the embassies and consulates to have their own election monitors to count the votes. It was capitulation pure and simple, shame on them. Many of them got involved in the Green Movement protests thinking it will be a quick victory, they were not prepared for a long life in exile and they saw this as their chance to patch things up with the regime. The establishment also needed to create the usual lesser evil choice. Hassan Rowhani (Feridon) who has been a pillar of the establishment and involved in the highest ranking intelligence circles of the Islamic Republic was remanufactured as a "reformist" saviour! Rowhani has never been a reformist, even according to the Iranian version of reformists. He was a staunch supporter of Ayatollah Khomeini right from the beginning and was the first person to suggest calling him Imam Khomeini, a title usually saved for revered Shiite saints only. In 1999, Rowhani as the head of Iran's Supreme National Security Council demanded the death penalty for student protesters after 19 universities were engulfed in six days of protests across Iran. Even during the post-election protests, Rowhani never sided with Moussavi and Karroubi and on 14th February 2010, when the last major street protest by the Greens led to the house arrests of Moussavi and Karroubi, Rowhani condemned the protests as "an attempt by a few misguided people" and asked the judiciary to "carry out its innate duties against this counter-revolutionary protest". During the TV debates however, Rowhani talked about moderation, avoiding extremism and how he managed to fool the West in negotiations and buy more time during his time as Iran's nuclear negotiator. He boasted how the Islamic Republic managed to quadruple its number of centrifuges during his time as the negotiator without suffering sanctions, and he described himself as a lawyer and not a warlike figure. On the morning of the elections a reliable source told me it looks like the Supreme Leader's office are happy with Rowhani becoming the next president and they will avoid the second round too. The six remaining candidates were Rowhani on one side and a fragmented vote amongst the other five on the other side. They need a new face to negotiate with the West and they think Rowhani can get them out of the present quagmire. While everyone was anticipating whether it will go to the second round or not, I was telling them confidently that Rowhani will be announced the winner in the first round. "Neither Gaza nor Lebanon, We Die Only for Iran"
The Supreme Leader won the main battle but the price of the victory had some costs for him too. The long time it took to count the final votes and announce the results showed that the swift announcement of the results in 2009 was a mere wizardry. The few votes cast in favour of Jalili in remote villages and provinces broke the myth, propagated by mainly Western analysts, that Ahmadinejad had a lot of support in villages and small towns. The actual support for the regime and the Supreme Leader can be extrapolated from these results as around 8 million in the most optimistic estimate, around 10-15% of the population. Nevertheless the main price, another massive turnout, was what they gunned for most and they got it. This may be the last time we see a directly elected pre-selected candidate in the Islamic Republic. The presidential elections are always a headache for the regime and as the Supreme Leader has hinted in the past, next time we may well see a constitution change that will lead to the Majlis choosing the next president. You hit the nail right on the head! In many ways this was just a knee jerk wave of fevour. Wishful thinking. The lesser of evils. Stoked up manipulation with Iranian's swept along by being fooled into thinking that least voting was still a way to have some kind of voice! A last ditch goodwill gesture if you will, that Rohani might be the only way to put a chink of light in the Regime's dark system! Well, let's see how many political prisoners get released now? Let's see how quick there's equality for women? Let's see ALL the freedoms of the Press, assembly, voice and expression eh??? If not, something tells me that not even the honeymooning Regime will be able to stop the next volcanic rage of the people with their integrity, intelligence and forgiving trust having once again been so cynically spat upon! Fool me once and all that---- So until REAL changes occur for a proper democracy free from a theocratic tyranny - it's still AZARDI IRANI! Of course, there is no way whatsoever to verify the Interior Ministry's claims of "72%" voter turnout, as teh IRI does not have an independent election commission. FWIW, Thomas Erdbrink (who is hardly a harsh critic of the IRI) did visit some polling stations and mentioned one in south Tehran that was largely empty and said that polling stations with state TV cameras were crowded and ones with the cameras were not. I would also say another exposed myth has been the notion of "high quality" opinion polls inside the IRI (a notion peddled by the Leveretts and their ilk). None of theses so-called "high quality" opinion polls had Rouhani receiving anywhere near 50% and a number of them actually had Qalibaf leading! That being said, I agree with your basic premise. It seems like it's 1997 all over, with the victory of another smiling charlatan mullah, the delusions about "reform", and the usual suspects trying to sell their "Grand Bargain" with the IRI. Never stop what you are doing Potkin. You are one of VERY few analysts that has a very good view of happenings in Iran. No matter how many people refuse to accept your points by throwing forth their propaganda or delusional opinions, your truth will always stand out. It seems like it's 1997 all over, with the victory of another smiling charlatan mullah, the delusions about "reform", and the usual suspects trying to sell their "Grand Bargain" with the IRI. Yes, it's important to recall the high hopes for Khatami, and how utterly he failed to meet them.